When you’re in immediate danger, you don’t have critical seconds to waste fumbling for your phone. Nor is it always possible to speak. Get Help On The Way Fast! When you don’t have time to get to your phone, let your device secretly alert your friends that you need help. Send an SOS notification to your newsfeed & immediately provide a link to your location at the click of a button. Get your device to send an SOS text message with your location. Get your device to let anyone & everyone on twitter know that you’re in danger & need help now! Use the panic button on your device to send an emergency email with a link to your location. Wearable Security Devices Use Every Available Means To Get The Help You Need Fast! When you’re faced with immediate danger, you need more than one way of alerting people that you need help. While you’re in complete panic dealing with getting out of the situation, you don’t have time to be finding your phone. Wearable personal security devices are more than just a panic button, they use today’s technology to maximise the visibility of your emergency. And what’s more, when you’re face to face with the person that is putting you in danger, your alert can be sent discreetly at the push of a button. * Every personal security device has different features. 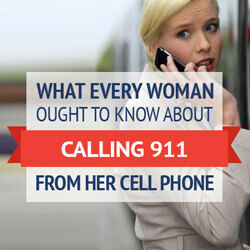 Most women are shocked to learn that 911 can’t automatically locate them when they call from their cell phone. And even worse, that their location information is likely bouncing from cell tower to cell tower before it even comes close to providing 911 with the data they need to find them. Resulting in delays of up to minutes, when EVERY second counts. When you’re trembling in fear and facing a dangerous situation, you’re unlikely to be able to be able to speak, let alone accurately describe your location. Wearable personal security devices use EVERY available means to get your emergency location to the people that count. You call 911 in distress from your cell, hoping their technology is as up to date as your GPS enabled smartphone. Your location information is now bouncing around between the nearest cell towers that picked up your call. You may be pinpointed up to 3 football fields away from your actual location! If you’re calling from an indoor location such as a parking lot or a building, they may not be able to locate you at all. Feeling unsafe jogging alone, meeting a new client or going on a first date? This tiny safety device can let your trusted contacts monitor your whereabouts for up to 5 hours. And if things go wrong, it can send an emergency alert (with a link to your location) via text, email, Facebook & Twitter. One click is all it takes to send for help. From elegant necklaces to fashionable bracelets. Personal security systems so intelligent, nobody can tell you’re wearing them. If you’re faced with a dangerous situation, pushing the hidden button on your jewelry is all it takes to send for help. 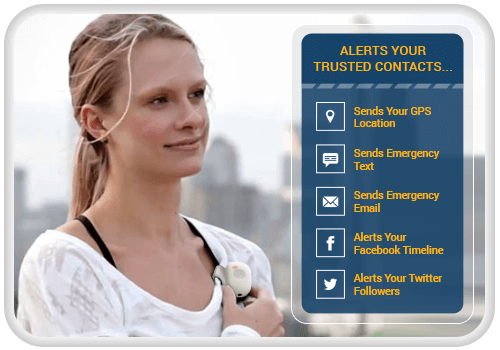 Your chosen trusted contacts will be sent an emergency message with a link to your location. Why Can't They Locate Me?